Do not go too close to the river. How popular is Treptower Park? People normally club together Gemaldegalerie and Museum Island while planning their visit to Treptower Park. Wow! I've lived in Berlin for 15 years and only just last year made it to the Treptower Park Monument. What a colossal miss (of me)! The monument is awesome and super impressive. Also it's big enough so the hordes of tourists don't step on each other's toes. Classic Soviet style monument. Glad this one is still standing, some thousands of them have been removed all across eastern German towns and cities. There is nothing random or simple about this memorial. It tells a story using powerful symbols and carefully chosen massages. From the post-war Soviet point of view. This is a high-quality propaganda that may help you understand the zeitgeist of the period. Large, safe and well patrolled park in former East Berlin. Largest Soviet era war monument outside of former Soviet Union. Lovely walk along the Spree too. 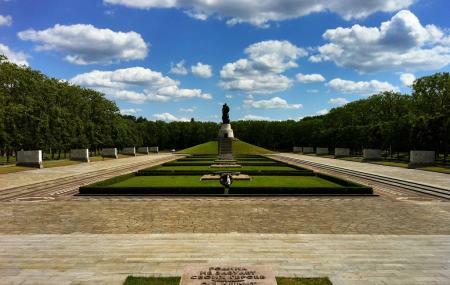 Treptower Park is the perfect place for a day out. In 84 hectares of greenery you can stroll along the riverside path, across sunny lawns, past the rose garden and along the shady avenues of plane trees. When it was opened in 1888, Treptower Park was a novelty for the time, a public park open to all the city’s inhabitants. Gustav Meyer, a pupil of Lenné, designed the park in the English style.